Nakheel has officially opened a waterfront retail Pavilion at its new, Dh450 million Jumeriah Islands Townhouses community, bringing 14 shops, restaurants and cafes to the neighbourhood. Jumeirah Islands Pavilion, inaugurated on Thursday by Nakheel Chairman Ali Rashid Lootah, is the fifth community retail centre in Nakheel Malls’ growing collection of neighbourhood shopping and dining hubs across Dubai. It will serve 8,000 residents at Jumeirah Islands and provide a new destination for people living and working nearby. Set among lush gardens and greenery, the Pavilion is flanked by a 1.1 km waterside jogging track. The anchor outlet, Choithrams, is complemented by a range of cafes and restaurants including Oregano, Nando’s and The Hamptons. There’s also a Round 10 Boxing Club, medical clinic, beauty salon, barber’s shop, pharmacy, and dry cleaners. Delivery of the Pavilion – which has 30,000 sq ft of shop space – comes as handover of homes at the premium residential community is in full swing. So far, 25 properties have been handed over, with the remaining investors due to collect their keys shortly. The Townhouses and Pavilion are located on the north-western side of Jumeirah Islands, one of Nakheel’s most mature residential communities and among the most sought-after in Dubai. Comprising 46 islands, known as ‘clusters’, Jumeirah Islands has 767 luxury villas and mansions, as well as mosques, nurseries and the Jumeirah Islands Club featuring restaurants, a pool and fitness centre. Complementing the villas are 246 luxury duplex apartments at Jumeirah Heights. 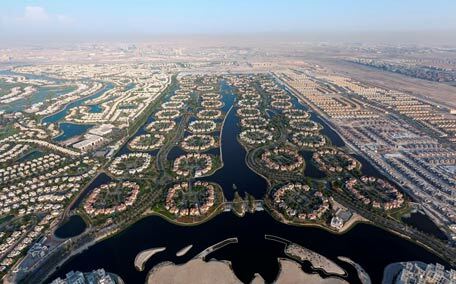 The villas, apartments and townhomes that make up Jumeirah Islands are home to more than 8,000 people. Nakheel Chairman Ali Rashid Lootah said: “Today marks the delivery of Pavilion number five in our growing collection of community centres, which are key to our Dh16 billion retail expansion. The full line up of outlets at Jumeirah Islands Pavilion: Choithrams, The Hamptons, Mikel Coffee, Mawlawiyah Lounge, Karam Beirut, Oregano, Nando’s, AVEC, Al Garhoud Private Hospital Clinic, The Loft Fifth Avenue, Super Trim, Round 10 Boxing Club, Life Pharmacy and Champion Cleaners. The Jumeirah Islands Pavilion complements Nakheel Pavilions at Al Furjan, Jumeirah Park, Discovery Gardens and International City. A second Pavilion at Al Furjan is on the way, along with one at the Badrah community in Jebel Ali. Nakheel’s current and future retail developments – including large-scale destination developments, traditional souk-style complexes and neighbourhood Pavilions – have 17 million sq ft of retail space between them, with over four million sq ft already in operation. Among the upcoming projects is the Dh6.1 billion Deira Mall – the biggest retail destination in Dubai in terms of retail space – for which a construction contract worth Dh4.2 billion was awarded earlier this week. The gated Jumeirah Islands Townhouse community comprises 84 four-bedroom homes, ready for handover. Each covers more than 3,600 sq ft and features a double garage, maid’s room, study and private garden. The complex has a communal pool, gardens and jogging track. Prices from Dh4.1 million.